The Lausanne Movement Canada (Lausanne Committee for World Evangelization in Canada) exists to connect influencers and ideas for global mission. Lausanne connects influencers and ideas for global mission, with a vision of the gospel for every person, an evangelical church for every people. Christ-like leaders for every church, and kingdom impact in every sphere of society. To further this mission, the Lausanne Movement Canada may collect, process, and use your personal information. The purpose of this Privacy Statement is to explain to you how Lausanne might use your personal information and how Lausanne takes seriously its obligation to you to protect your rights and your personal information. circumstances, Lausanne may contact you to specifically notify you of changes to this Privacy Statement. It is the global policy of the Lausanne Movement Canada to exercise a high standard of care in its handling of the personal information it collects, processes, and uses. LMC will maintain appropriate policies and processes throughout the organization to enhance the protection of personal data and ensure compliance with applicable laws and regulations. LMC is also committed to the periodic review and augmentation of these policies and processes as part of its Global Privacy Program. Lausanne is an organization that functions globally and therefore maintains data protection policies and practices consistent with accepted international data privacy principles. These policies supplement national data privacy laws, and any national law takes precedent in the event it conflicts with LMC’s policies. In Europe, the General Data Protection Regulation (GDPR) came into effect as of May 25, 2018. If GDPR and/or other EU privacy laws apply to you, this Privacy Statement describes how you can exercise your rights. Demographics: Includes information about who you are, where you live, and what programs and activities in LMC may be of interest to you. Financial History: Includes historical information on your donations to LMC, other financial transactions you have had with LMC including registration fees for LMC gatherings and events. Payment Information: Pertinent financial details for Lausanne activities are provided by you directly to third party payment gateway providers. All payment gateway providers used comply with the highest level of security required. Requests and Preferences: Includes your preferences for how the LMC will communicate with you (including which types of optional email communications you would like to receive from LMC). LMC uses the personal information you provide to better serve your requests and to connect you further with the mission and ministry activities of Lausanne. Whether you are involved in a Lausanne event/gathering, accessing Lausanne resources, or donating to our missional objectives, Lausanne will generally use your personal information to achieve its legitimate interests related to our organizational mission. We do not sell, lease or rent your personal information to others. Lausanne will only process your personal information in accordance with an appropriate legal basis and only for the purposes described in this Privacy Statement. 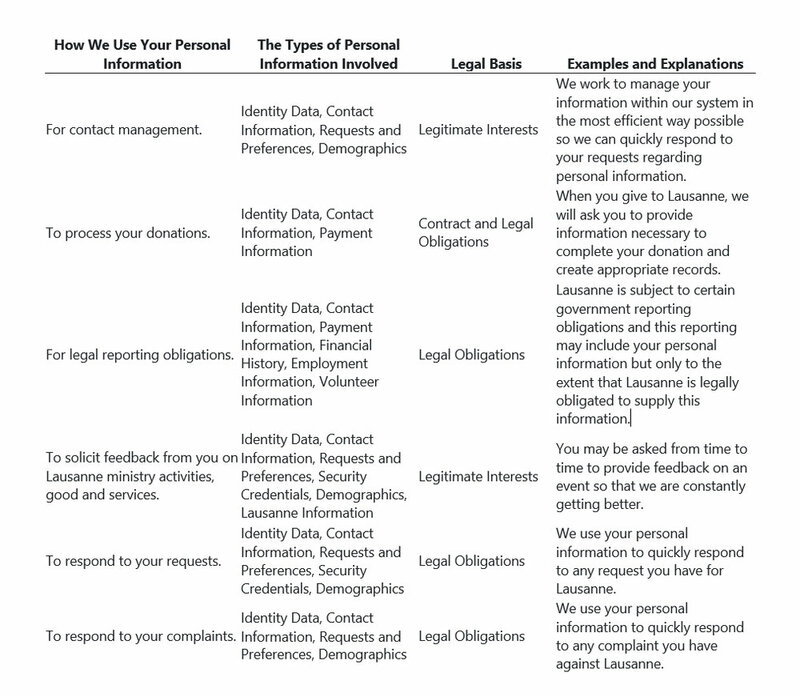 The table below provides a list of examples of how we may use your information, the types of information involved, and the legal basis for our use of your information. Personal interactions: The ministry of Lausanne is very much defined by relationships between individuals connecting through Lausanne events and activities. Direct Requests: You may have reached out to Lausanne on your own or visited our website. If you have inquired about a Lausanne activity, subscribed to Lausanne email communications, engaged in a Lausanne activity, made a donation, registered for an event or have otherwise chosen to give Lausanne Information, we have your personal information. Please read this Privacy Statement carefully to understand your rights and our commitments related to your personal information. Lausanne leaders and those formerly affiliated with the organization. Third party service providers Lausanne has contracted to assist in the types of uses described above, including web-based contact management service providers, cloud service providers, companies assisting in the processing of your donations or other financial transactions, and email marketing service providers. Lausanne has entered into contracts with these third party service providers without neglecting the protection of your personal information. Lausanne Movement Canada is an active member of the global Lausanne Movement which operates and holds events in different parts of the world. Therefore, Lausanne may transfer your personal information from one country to another for use as relates to specific events. All individuals in the European Economic Area or the United Kingdom need to be aware that we may transfer your personal information outside of the European Economic Area or the UK for processing. Any transfer of personal information from country to country will be done with appropriate safeguards and in compliance with applicable laws. If you are located in the European Economic Area or the United Kingdom, you have certain rights related to your personal information. If you wish to exercise any of those rights, please reach out to Lausanne by using the Contact Us form. We will respond to your request within 30 days. We may need to verify your identity in order to process your request. These European rights specifically are identified below. However, the Lausanne Movement Canada is extending these same rights to others in the Lausanne database/information management systems who live in countries worldwide. Right of access: You have the right to know that we are processing your personal information, how we are processing this information, and for what purposes. This Privacy Statement is intended to provide the transparency necessary for you to know this information, but you can certainly make additional inquiries to Lausanne by using the Contact Us form. Right to Edit and Update Information: You have the right to rectify inaccurate information, update your personal information, and supplement incomplete information in the Lausanne system. Lausanne’s network solutions will often allow you to make these changes on your own by managing your “opt out” options. Where this feature is not accessible, you can reach out to Lausanne by using the Contact Us form, and we will address your request without undue delay. c) If you object to Lausanne processing the data in a certain way or for certain purposes and Lausanne does not have legitimate grounds to continue processing the information. what reason we cannot fulfill your request. d) If you have objected to the processing of your personal information and there is a pending determination as to whether our legitimate grounds to process override your rights described here. As with any request for erasure of your personal information, you also have the right to be notified by us about a restriction in the processing of your personal information. You can make this request by reaching out to Lausanne by using the Contact Us form. c) The processing is carried out by automated means. You can make this request by reaching out to Lausanne by using the Contact Us form. 6. Right to Object and Automated Individual Decision-making: You have the right to object to our processing of your data when our legal basis for processing is Lausanne’s legitimate interests based on your particular situation. Upon receiving an objection from you, Lausanne will cease to process your information unless we can demonstrate compelling legitimate grounds for the processing which overrides your rights and freedoms. Particularly, you have the right to object to the processing of your personal information related to direct electronic marketing. You also have the right to object to our processing of your information where decisions on processing are made by automated processing which has a legal or other significant impact on you. You can make this request by reaching out to Lausanne by using the Contact Us form. 7. Right to Withdraw Consent: Lausanne is primarily processing your information based on our legitimate interests and other obligations. However, where you have given consent to us to process your personal information, you have the right to withdraw that consent and we will promptly respond. You can make this request by reaching out to Lausanne by using the Contact Us form. 8. Right to File a Complaint with the Data Protection Authority: We want to provide the best service to you related to these requests and resolve any issue you have with Lausanne related to the processing of your personal information. You, however, always have the right to contact your local data protection authority for assistance or to make a complaint. While the rights explained above do not apply to those outside of the European Economic Area and the UK, as a matter of rights and freedoms, we still do care about your questions and concerns related to your personal information and will take them seriously. If you are not located in the European Economic Area or the United Kingdom, you can reach out to Lausanne by using the Contact Us form to make a request related to your personal data. To safeguard and secure the information we collect, Lausanne has applied appropriate physical, electronic and managerial procedures to prevent unauthorized access and maintain data accuracy. The Secure Socket Layer (SSL) protocol is used to encrypt and protect all Internet data transmissions. The padlock icon in your browser’s window signifies that a site is secure. Sometimes password protection is used to protect your privacy and security. Lausanne will continue to augment current security procedures and adopt new security protocols as necessary to meet the standard of care we have promised in our policies and in this Privacy Statement. Lausanne is also committed to a prompt response to any potential data breach and has instituted a Data Breach Protocol Process which includes timely notices as required by applicable law.